Over time, the Internet has become almost second habitat for people. Social networks, business websites, blogs, forums, any information projects, all of these sites have become part of the lives of its members. When creating an offline business today, one thinks that it's necessary to run a site. Because for those who are willing to share their ideas, there is barely a wider audience than the internet. Naturally, anyone who have ever been interested in making a site, have heard the word hosting. However, not everyone knows the difference between the types of hosting, and which one of them to choose. We specialize in VPS (virtual private server). It is a balanced option, a compromise between a cheap virtual hosting and expensive dedicated server. But VPS hosting is not as well-known to users, as the rest of sorts. 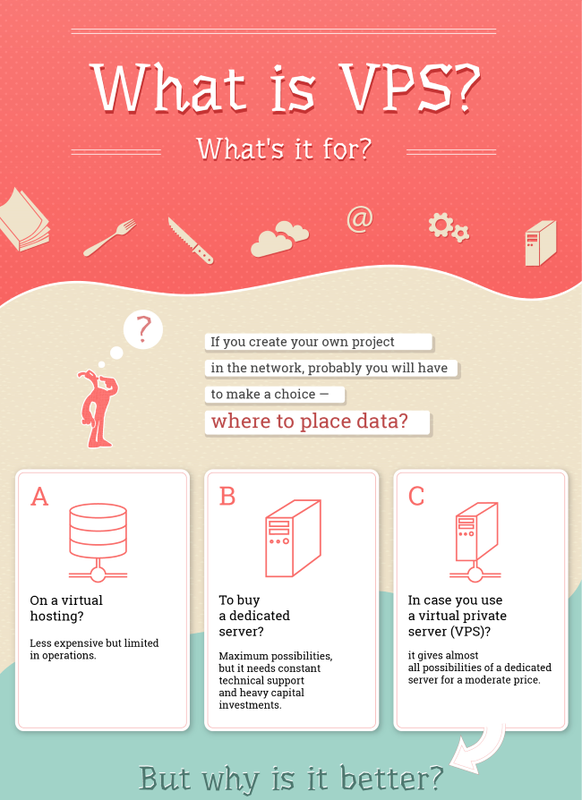 So our first infographics covers the topic of what is VPS, to whom it might be suitable, how to choose it and other issues for those who want to understand. So, if you compare VPS and shared hosting, you can find at least 8 advantages of VPS. Such as stability, root-access, installation of any software, the ability to backup systems installation and OS re-installation. VPS is essentially similar to a dedicated server, but is cheaper, plus independent of problems with iron. If you look inside the VPS, you may find that the virtualization technology is what matters most. There are three main types: OS-level virtualization, paravirtualization and full virtualization, each one suitable for different projects. From mail servers to resource-demanding projects. That said, no matter what your project is, you can choose a suitable VPS. But there's a lot of VPS-providers. And it is crucial to pick up the right host. It's important to take into account all the factors: the reputation of the provider country collocation, the price, all the technical details, the presence of the test period, the customer support quality. Any of these factors has it's impact on the price. It's generally not a good idea to fall for a low price, but on the other hand, a high price does not always mean a good quality. Evaluate the pros and cons. In the meantime, check out the infographics we made - it's a bit more colorful than the plain text (click on the image to view full size infographic). Click on the image to view full size infographic. Looking for unmetered VPS hosting? Trying to choose the best XEN VPS or OpenVZ VPS for your project? We offer European and USA virtual private servers with different virtualization types and management options. Contact our support to assist you with the right choice.